“We decided to implement an integrated farming system that allows us to constantly monitor weather conditions. Thanks to this protocol, we can predict if and when our vineyards will be affected by fungal diseases or insects. As a result, we can limit the use of fungicides and pesticides and use organic methods instead to improve the health of the plants”. we decided to make a contribution to scientific research by partnering with the Italy’s Center for Food Science (ISPA-CNR) and the department of agriculture at the University of Bari. The initial subject of our joint studies was the identification of indigenous yeasts on the skins of Negroamaro grapes. More recently, our focus has shifted to Brettanomyces and its impact on wine aromas and flavors. The same year, together with our vineyard manager Cataldo Ferrari (one of the region’s leading grape growers), we decided to increase the quality of our wines by minimizing the environmental impact of farming practices. We decided to implement an integrated farming system that allows us to constantly monitor weather conditions. Thanks to this protocol, we can predict if and when our vineyards will be affected by fungal diseases or insects. As a result, we can limit the use of fungicides and pesticides and use organic methods instead to improve the health of the plants. we’ve had excellent results thanks to this program, even as the weather patterns become more and more unusual because of global warming. We’ve been really placed with the wines that we’ve made since we started. Not only are the wines a more transparent expression of our terroir, but they are simply better wines that wine lovers more thoroughly enjoy. 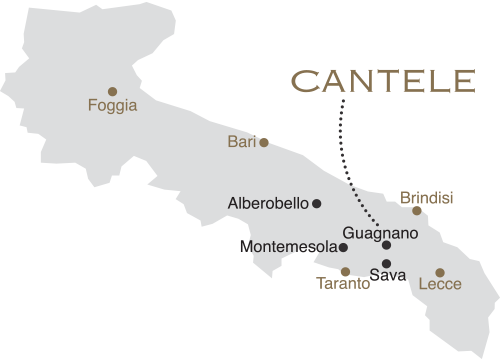 Mostly local grape varieties like Negroamaro, Primitivo, Susumaniello, and Fiano del Salento. But we also grow Chardonnay, which makes for wines with excellent aromatic character thanks to our unique subsoils and climate. Our subsoils are extraordinarily fertile thanks to the natural presence of limestone and clay. Dating back to the Cenozoic Era, the soils are deep, with medium to high permeability, a healthy presence of calcareous soil, and good pH. Our vineyards face north to south, with excellent ventilation due to the north wind and to siroccos from the south. The rows absorb the perfect amount of sunlight on either side, creating ideal conditions for the ripening of the berries. Many of our older vines are bush-trained, the traditional alberello system that uses no trellising but delivers fantastic results. Our younger vines are trained using classic systems, mostly cordon-trained spur-pruned and Guyot. The rootstock used for our newer plantings have medium to low vigor, like SO4 and 161.49. They are ideal for our subsoils and they guarantee moderate production levels and high quality. We short spurs for our Negroamaro and Primitivo, which are trained using a permanent cane (for both head-trained and cordon-trained vines). Guyot is used for our new cane vines, like Chardonnay and Fiano. Situated in the heart of the Mediterranean, Puglia is a land of rare beauty, where vast plains alternate with gentle hills. Salento, the long narrow strip that forms Puglia’s southern peninsula, extends between the Ionian and Adriatic seas. It’s an area rich with ancient olive groves and vines, enchanting beaches and jagged rocky shoreline, classic grottos and some of Italy’s best farmland.